In the past, we have discussed the importance of having your air ducts cleaned on a regular basis. However, most homeowners believe that their homes are clean enough that they don’t have to worry. You may be shocked to learn just how many harmful contaminants gather inside of your air ducts, even without you noticing them! Here are some of the biggest threats hiding in your HVAC system. Inanimate particles coalesce to form a thin layer of dry dust inside your air ducts. When the HVAC system turns on, these particles are swept up and sent back out into your home. They float around and are breathed in. While everyone responds to these particles in different ways, we know that pet dander and dust can seriously irritate sinuses and allergies, and the more of these particles are in the air, the worse the symptoms will be. These particles usually come with heftier warnings because they are not safe for inhalation and could cause long-term breathing issues if you aren’t careful. 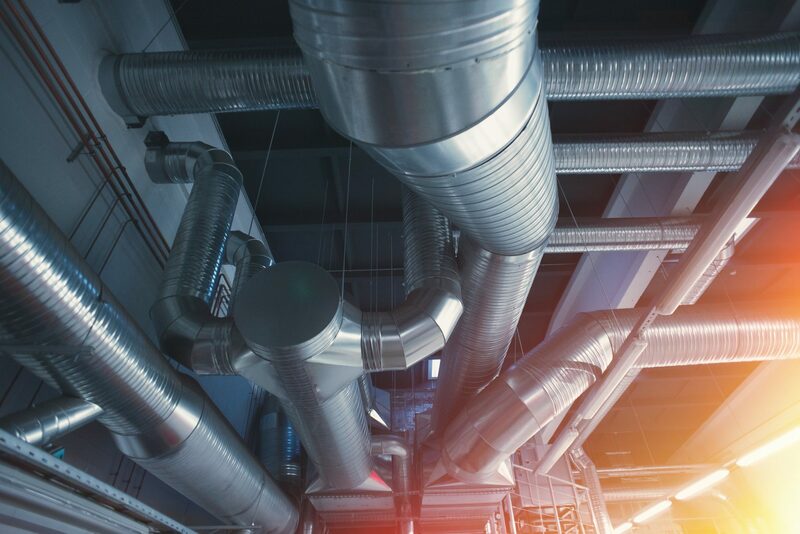 Even if you have not completed any recent construction projects around the house, rusty lines in your HVAC system can cause debris to flake off the inside of your ducting and float down the line. Unfortunately, your air ducts also provide a perfect place for mold and mildew to take root. When layers of dust gather in your air ducts, and then moisture gets in from a leak or condensation in your cooling system, you have a recipe for disaster. Once a mold spore takes hold in your system, it will continue to multiply until you begin to notice a smell in the ambient air of your home. If there is mold in your air ducts, your system could be blowing loose spores out into the air, or onto your walls and surfaces where it will begin to grow anew. Remediation for serious mold issues like this can cost thousands of dollars and your health. Bacterial growth is another issue. Bacteria tends to grow in warm, moist areas where it can replicate rapidly. The drip pan in your attic is one such place where bacterial growth could succeed. You should also keep in mind that when organic materials of any kind, including pollen and pet dander, build up in one place, they will eventually begin to decompose. This decomposition causes another growth of microorganisms as the material starts to break down, creating bacteria that flows through your ducts and winds up on your countertops, beds and other surfaces where it can cause chronic or repeated illness. Now that you’ve seen some of the most common air duct contaminants, you can see why air duct cleaning in Phoenix is so necessary, but how do you know when it’s time? In general, experts recommend having your air ducts cleaned every other year to prevent excessive buildup in your system. Also, you should have your ducts cleaned anytime there has been a water leak or a construction project that may have caused buildup to accumulate faster than usual. If you feel like you are always dusting, or your allergies are getting consistently worse with time, having your air ducts cleaned is a good place to start. Even if it is not the only culprit, it can still provide notable improvements in your health. If you are noticing a moldy or mildew smell settling in your house, make sure you call right away because mold spores can cause significant damage to your health and home. If you see any signs of damage to your HVAC system, you should also make a call. Water leaks in your ducts could be introducing outside particles into the system and make things even worse. Your ducts should be properly sealed and cleaned to keep your air conditioner in excellent shape year round. 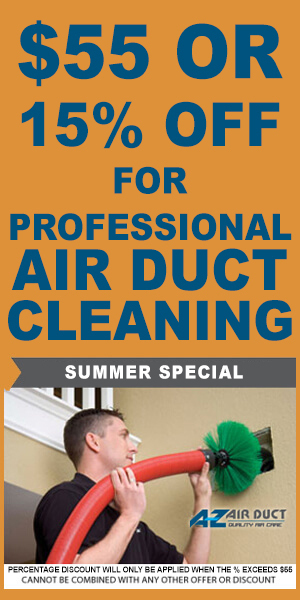 For more information about scheduling your air duct cleaning in Phoenix, contact A-Z Air Duct today. 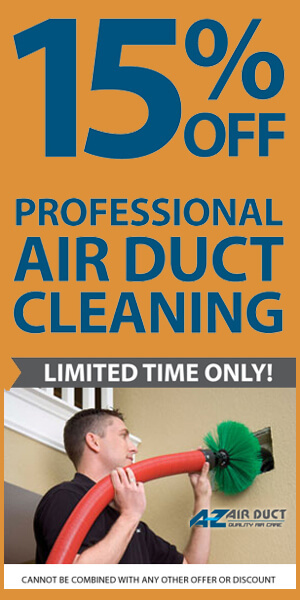 We can put you on the schedule to ensure that your ducts are as clean as can be for a truly healthy home. Our team of experts can clean your air ducts in no time at all using the best available methods for breaking up all the dirt and grime.